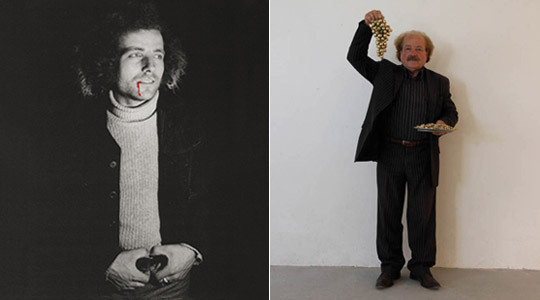 Alessandro Jasci was born on November 6th, 1946 in Frisa (Italy). He studied at the Lanciano’s Institute of Art and in 1963 he moved to Florence to study at the Academy of Fine Art, where he graduated in Sculpture in 1967. He lived creative experiences In the period of Academy of Fine Art, where painting and sculpture are constantly collected together. After the Venice Biennale, many fellows of the Academy discovered the Pop-Art as a new religion and the environment became more and more challenging. In this new perspective Jasci began to attend many art happening and to visit the exhibitions of the galleries “Attico” and “Tartaruga” in Rome. In these stimulating years of change Jasci perceived that the artist as a character is an integral part of his work and began his "Biography as an art." He used to say: "The art feeds itself with life and there is nothing better than the artist's life." In this path he began to read "Le vite" by G. Vasari, and he is specially interested in the biographies of major contemporary artists. Exploring the performances of some American artists, Jasci began to think about a series of "living pictures." As a student of the Art Institute he helped his professor to create a series of "living" works with artists of the past that overlies wagon during the parade on Tuesday of Easter. Then, inspired by the "La Madonna dell’uovo" by Piero Della Francesca, completed the first version "L’uovo ha fatto me” in his study (1970), afterward presented in the exhibition "Situation Concepts" (1971) in Innsbruck (Austria). In his first solo exhibition at the gallery of Turin LP220 in 1970, Jasci presented the works "Sogni" (Dreams): wall signs with the description of dreams of 4 "sleeping" persons wrapped in white sheets on the floor. Another work is a black rectangle on the wall with the words “Paesaggio senza colore” (Landscape without color) and a tape recorder with noises recorded in the city. In Turin, the city of '"Arte Povera", this exhibition so innovative was not perceived in the right way and the gallery, after few days closed the exhibition. After the Academy Jasci travelled to Europe and lived for a period in Düsseldorf and Rome and in the spring of 1969 he moved to Milan. From this moment he begans his total involvement with life and art. He attended the galleries more proactive as Toselli, Diagramma and Lambert and become friend of the artists Luciano Fabro and Fernando Toselli who introduce him to attend the most interesting artists of Milan. He exhibited in two group shows where he presented the work "Confine" in Lambert’s gallery and "Paesaggio senza colore" in Toselli’s exhibition. Jasci tell his Milan experience in an article published on Flash Art in October 2012 with the title: "MILANO capitale dell’Arte in Europa dal 1969 al 1973." In this period also opened the Carioni gallery which will become in a short time, the center and purposeful encounters of the world art. Jasci and Tonello became two artists referenced in the Gallery. In the second solo exhibition at Carioni, Jasci presented a series of dreams on canvas and marble but also the works "Lettura" (Readings), a "Ritratto di marmo” (Portrait of marble) and "Transfigurazione” (Transfiguration). Jasci remember Luciano Fabro’s words: "Dear Alessandro we artists have to thank you because you brought the fantasy in the art". In Milan Jasci realizea series of works where his biography becomes the common thread between life and art. His image enter in almost all his works. In an interview he said: "My work follows an idea where the concept of literary work expands itself and make room to a theatric art and my image, repeated almost obsessively, is nothing more than the vision of the passing of time through the transformation of my body". Jasci conceived the art work as a moving concept. Around each project he realized only a small number of work to make the concept more readable. He remembered: "With Fabro we always talked about the art work that had to be the result of a concept. After the implementation of a series of works, artist had to think of a new concept". Fabro, after the series of "Italie" began the series of the "Piedi” (Feet) while Jasci realized the "Dreams" on canvas and "Artista e Modella" (Artist and Model) on glass. In addition to the "behavior" in those years, there was the idea of giving to life the identity and continuity of the history of art. In 1971 Jasci participated in the Bienniale di Bolzano and presented a work titled "Angelo Artista": a performance-reading where the artist read a biography, changing his name in place of El Greco. At that time he realized marble slabs on wich are reported negative critical judgments regarding the works of different periods and on this occasion he changed the name of El Greco with His name and the name of Tiziano with Fabro. Jasci in 1975 moved to Rome, the city where the art is layered and contaminated for thousands of years, living in contact with monuments became universal, and turned in a work called “Museo componibile” (Sectional Museum). Sometimes even with the help of his students of the School of Art in Rome, he realized works with clay, terracotta, plaster, sand, creating a collection of short stories. Today Jasci sees with great pleasure that artists like Urs Fischer, Fischl & Weiss and many others carry out work very close to his search of those years. In 1979 he designed an art magazine, NEW ART, where many proactive international artists were invited to “arrange in page” their works in that publication. Jasci lived art as a total involvement and in 1988 organized "Italiana Nuova" where he presented the Italian art after the Transavanguardia and in 1989 he theorized Artmedia because: "With the end of our century and with the emptying of the post-modern phenomenon, we enter in an age (to use an assertion by Hervé Fischer) of post-historical Era, that is the Era of "events". Jasci has always worked silently and out of the spotlight but, he also experienced first hand the Italian "cultural climate", founded an international art magazine and organized exhibitions such as "Italiana Nuova" and "Artmedia." For 40 years he continued to explore the themes of the "Spirit of time" doing, many times in advance, a work international, critical, imaginative and poetical oriented. Jasci lives and works in Rome and Frisa (Italy).